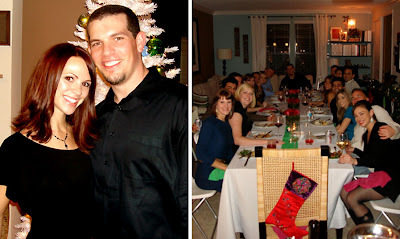 My husband and I held our 5th annual Christmas dinner party on Saturday night and it was a success! The evening went smoothly and everyone had a wonderful time. 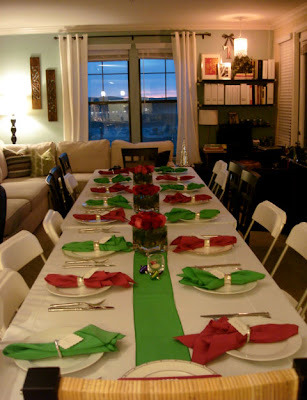 I went with kelly green and magenta for the color scheme and wanted the overall feeling to be fun, festive and cheerful. I purchased the fuchsia roses from Costco (spent a total of $30 for (4) dozen) and put the arrangements together the night before. 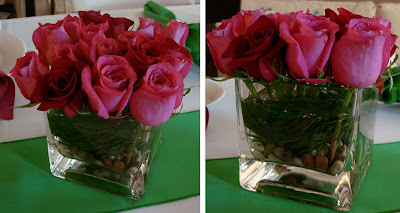 I used small square vases and filled the bottoms with tiny pebbles from Ikea to anchor the roses, then wrapped fresh pine needles around the inside of the vase. It was super easy and I put them outside overnight to prevent them from wilting. I was finally able to put my Kate Spade wedding china to good use (I only have 6 settings so I mixed them with plain white)! 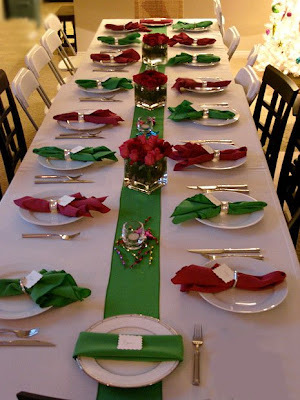 For the napkins, I alternated magenta and green every other setting, and placed a small handwritten place card in each napkin ring. We used our 6ft. dining table and butted it up against an 8ft. rented table. I had to mix and match our dining chairs with rented folding chairs...it was a bit of a mish mosh but it worked out okay. Me with my wonderful husband Ryan and our 16 guests! I had a lot of fun preparing and planning for our big night...but I'm glad it's over :) As I'm sure many of you know, it's a lot of work but so worth it. Your table looks beautiful and your roses are divine, xv. Aww looks wonderful - oh I bet you guys had a great time! The table looked lovely! I love he photo of you & hubby you are beautiful!! Theirs always a sigh of relief for me after every event.. Looks like you pulled off a fabulous party girl! Wow, what an amazing set up. That runner, those flowers--it just all looks absolutely lovely. Looks like a great time. 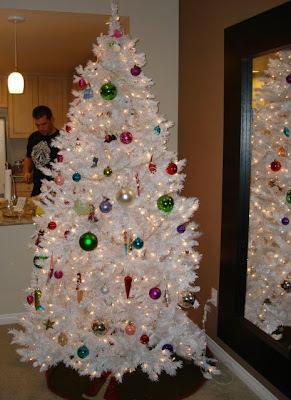 Your tree is awesome! Glad it all went well and that you had a good time. Fun. I love your tree! Great picture of you and hubby—great looking couple! As I said before, you are brave soul to entertain that many! Looks like you had fun and it was well worth it! What a beautiful table and tree! I love the green mixed with magenta pink - it looks very festive indeed! so much fun! it looked great. Thanks for posting pictures! Looks like you and your guests had a great time. I guess you are already thinking of next years theme! fabulous jules! beautiful down to every little detail :-) looking forward to seeing you on soon! Jules-so pretty.. I would love to be one of your guests! All of your decorations are so pretty (what a fun tree) and you look so pretty! Wow you did a great job, everything looks beautiful. You're so pretty! VERY nice gathering! 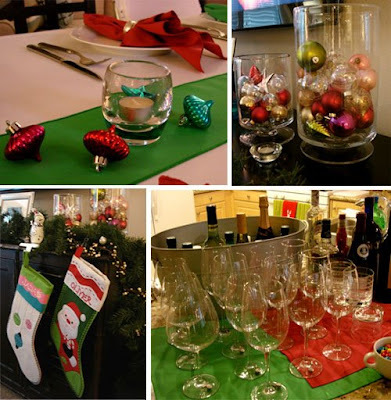 Entertaining during the holidays is the BEST! Everything looked stunning...particularly the tree! Turned out beautiful, great job! I love the elegant simplicity. I will keep this in mind for our various church functions. We're always looking for really pretty, but simple and easy.